The LinkStation Live delivers everything you could want in a NAS drive for the home, with single drive units available in a wide range of capacities from 250GB to 1TB. 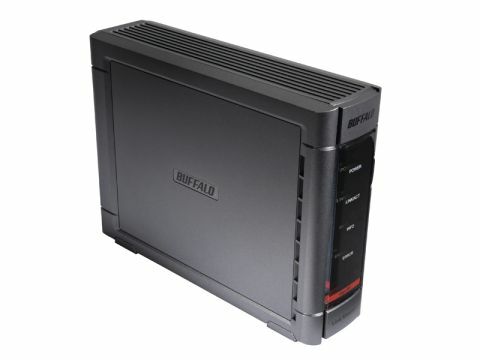 Combining stylish design with reassuringly rugged build quality, the smooth and quiet-running case plays host to a fast SATA hard drive, connected via a Gigabit Ethernet port. There are also two USB 2.0 ports, which come in handy for adding additional hard drives for extra storage space or back-up, the latter of which is simplified by the bundled Memeo AutoBackup software package. You can also use one of the USB ports to attach a printer, thanks to the drive's ability to act as a network print server. The automated set-up procedure is quick and easy to complete and there's plenty of scope for going further than the usual raft of basic NAS functions. For example, you can set up web access as well as setting security levels to limit access to specific groups or users. Multimedia functions are also handled particularly well, with a neat Direct Copy feature for transferring photos direct from digital cameras to the drive, and seamless integration with iTunes. For AV streaming, the LinkStation Live is also fully DLNA certified, making for easy playback of multimedia files through any other DLNA device. Overall, the performance and range of features is amazing, especially considering the Buffalo is one of the cheaper drives among its peers.